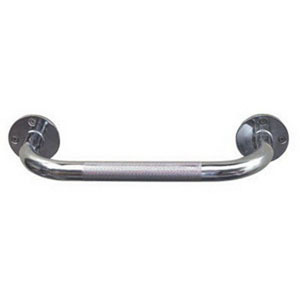 This Institutional Steel Knurled Grab Bar offers increased safety and stability. High quality chrome-plated knurled steel helps prevent rust. Complies with most government requirements. Mounting screws and gaskets are included. Offers increased safety and stability. High quality chrome-plated knurled steel helps prevent rust. Extends 2.875"-4 1/2" from wall.